The amount of trash that the United States produces is staggering. There are more than 3,000 operating landfills and more than 10,000 abandoned landfills in the U.S., according to Zero Waste America. Industry leaders are focusing on improving manufacturing standards and processes that lessen the burden and create more sustainable products for today and our future. The unintended consequence of manufacturing materials, such as plastic, is the vast amount of space that slowly decaying material requires. The Environmental Protection Agency says plastics accounted for nearly 13 percent of the municipal solid waste stream in 2011. Many suggest that plastic, along with rubber and Styrofoam, will take centuries to decompose. 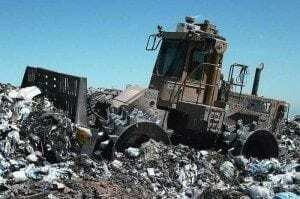 Many scientists agree that a significant amount of hazardous material escapes through leaking landfill liners, but it’s difficult to accurately measure the full impact. Landfills located near lakes and streams could potentially allow chemicals and gases to seep into ground water and enter the food chain through marine animals. While landfill operators and environmental advocates look for efficient liner mechanisms to control leachate, which is a solid-containing liquid that is generated when groundwater “percolates” through solid waste, industries are searching for innovative ways to manage and reduce harmful effects of their products. Rubber: What is the Industry Doing Today? Tires don’t decompose, and it is expensive to collect and repurpose tires. They are heavy, take up a lot of room and are not easily broken down into other materials. Thirty-five states charge disposal fees to offset the expense of collection, storage and processing, TireBuyer.com has stated. The company makes efforts to sell tires that are manufactured using sustainable materials and manufacturing processes. Kumho Tires is one brand that is incorporating more eco-friendly manufacturing into their business plan; reducing air pollution and incorporating oil-free processing procedures. The EPA estimates that more than 150 million pieces of e-waste find their way into the landfill every year. To offset this huge impact and encourage more consumers to recycle old digital equipment and related waste, Dell provides opportunities for recycling that include scrubbing information from hard drives, refurbishing equipment for continued use and connecting consumers to non-profit organizations that put used computer equipment in schools and other public agencies. Dell also offers a free mail-back service for any brand of equipment and ink cartridges. Hasswell, a manufacturing company based in China, makes machines that reduce size and volume of Styrofoam and other material waste. Its equipment is designed to handle cardboard with balers, densifiers for Styrofoam, shredders for plastic bottles and crushers for glass. Its website reports that 1,369 tons of Styrofoam enter landfills every year and burning Styrofoam products releases more than four dozen harmful chemicals. Sun exposure also releases harmful chemicals from this non-biodegradable substance. Andy lives in San Jose, Calif., is a full-time surf rat and a part-time photographer and journalist.